We continuously monitor a number of earnings-related indicators that up until recently were only available to us internally. 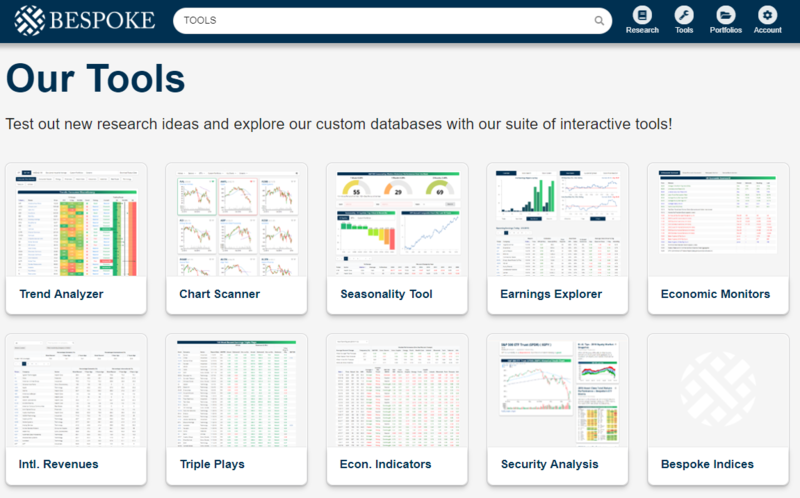 We have now made them available to Bespoke clients via our Interactive Tools section. Bespoke Premium and Bespoke Institutional subscribers can visit our Earnings Explorer at any time to see up-to-date readings of these key indicators. Start a two-week free trial to either membership level to access our Earnings Explorer now. The first snapshot below is an updated look at the rolling 3-month beat rate for both EPS and revenues. These readings show the percentage of companies that have beaten consensus EPS or revenue estimates over a rolling 3-month basis. As shown, the earnings beat rate has been drifting lower recently after peaking in mid-2018. Even after the declines, though, the current reading is still more than 4 points above the historical average. The revenue beat rate peaked at the same time as the earnings beat rate in mid-2018, but it has fallen a lot more since then and is now just above its long-term average. Top-line revenue numbers are much harder for companies to “manufacture” than bottom-line EPS, so we put more stock in the revenue beat rate than the EPS beat rate. 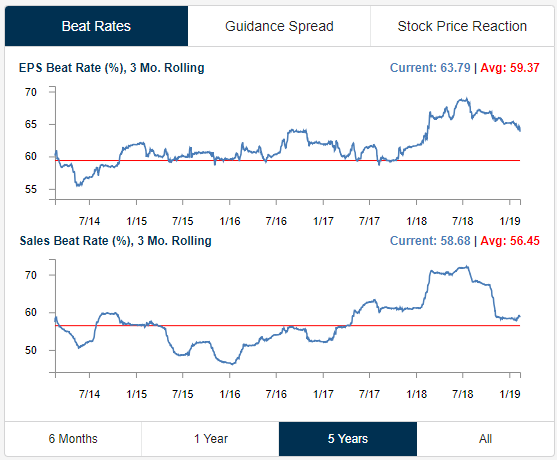 Our guidance spread measures the difference between the percentage of companies raising guidance and lowering guidance on a rolling 3-month basis. 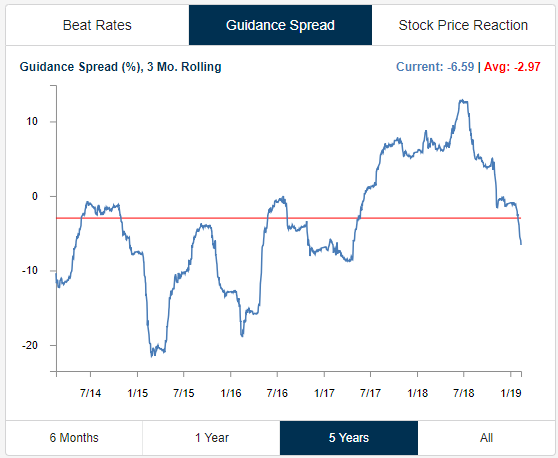 As shown in the chart below, the guidance spread reading currently stands at -6.59, which means a lot more companies have lowered guidance than raised guidance over the last three months. 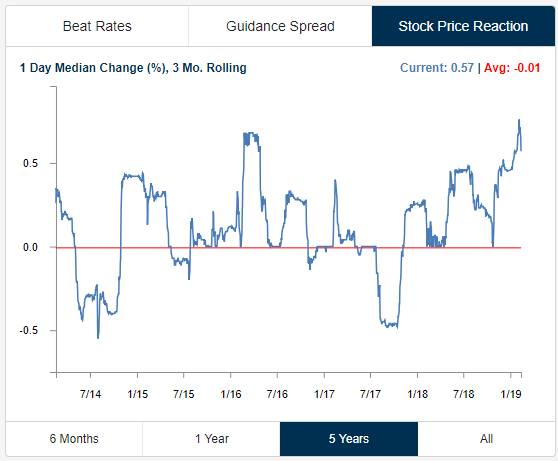 Similar to EPS and revenue beat rates, our guidance spread reading peaked in mid-2018 at a very high level of 10+. At its peak, companies were as bullish on the future as they had been in nearly a decade going back to the early days of the post-Financial Crisis bull market. Now the picture looks much different as companies can’t seem to lower guidance quickly enough. We’ll be watching closely to see when this reading is ready to stop falling and begin to turn higher again. As you can see in the chart, there is definitely an ebb and flow to it as companies collectively get either too optimistic or pessimistic. As beat rates and guidance readings weakened in the 2nd half of 2018, we didn’t see a corresponding drop in the price reactions of stocks reporting earnings. The chart below measures the median one-day price change that stocks reporting earnings are experiencing on a rolling 3-month basis. This reading tells you how positively or negatively stocks are reacting to earnings reports. As shown, earlier this earnings season, stock price reactions hit their highest level of the last five years. We’ve seen a drop, over the last few weeks, however, which is something to keep an eye on as the broad market continues to chug along in 2019. To monitor our proprietary earnings indicators on a regular basis, join Bespoke Premium or Bespoke Institutional today!